The 1970s saw the launching by NASA of the first four space vehicles to venture into the outer Solar System. They made history in two ways. Firstly they crossed the asteroid belt and carried out flybys of the four outer planets Jupiter, Saturn, Uranus and Neptune. Secondly they are going on towards the Heliopause where the combined 'wind' that comes from the rest of the galaxy is equal to the strength of the Solar Wind. It is true that the Sun's gravitation still operates on the Oort Cloud which lies outside this region but in many ways we can think of the heliopause as marking the frontier between the 'Kingdom of the Sun' and interstellar space. Pioneer 10 launched on 2 March 1972. It was the first spacecraft to cross the asteroid belt. It made the closest encounter to Jupiter and passed within about 130,000 kilometres above the cloud tops. It used the gravity and orbital momentum of Jupiter to hurl it towards interstellar space at 40,000 kilometres per hour which was enough to reach a velocity which would send it out of the Solar System forever into interstellar space. This is known as the sling shot effect. Its last message to Earth was received on 23 January 2003. Long after the Sun has become a red giant and then a white dwarf, Pioneer 10 will cruise on through	interstellar space bearing on its framework a gold anodised plaque, shown on the right above, designed by Carl Sagan and Frank Drake. It will tell any race of creatures that may find it who we were and to which star we belonged. Although the chances of it ever being found are extremely unlikely it adds a little poetry to the first space craft designed to cross the vast emptiness of interstellar space. By August 2010, Voyager 1 had reached a distance of 17.1 Billion Kilometers from the Sun and Voyager 2 a distance of 13.9 Billion kilometres. 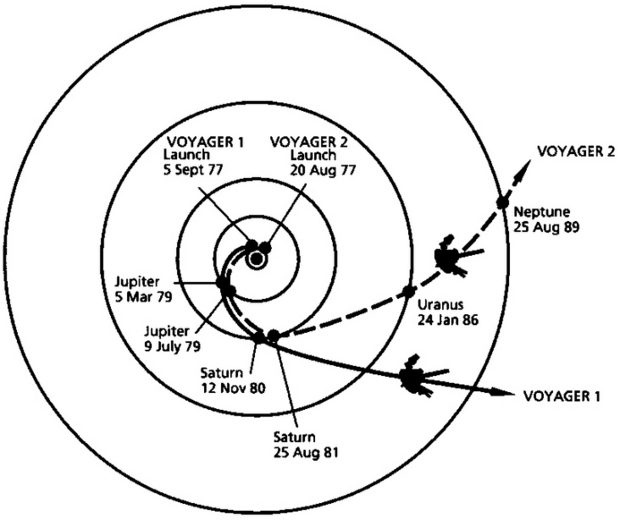 Voyager 1 is departing the Solar System at a speed of 62,400 kilometres per hour (39,000 miles per hour). Voyager 2 is departing the Solar System at a speed of 56,000 kilometres per hour (35,000 miles per hour). The Voyagers have enough electrical power and thruster fuel to operate until at least 2020. By that time, Voyager 1 will be 19.9 billion kilometres (12.4 billion miles) from the Sun and Voyager 2 will be 16.9 billion kilometres (10.5 billion miles) away. Eventually, the Voyagers will pass other stars. In about 40,000 years, Voyager 1 will drift within 1.6 light years of AC+79 3888, a star in the constellation of Camelopardalis. In some 296,000 years, Voyager 2 will pass 4.3 light years from Sirius, the brightest star in the sky. The Voyagers are destined—perhaps eternally—to wander the Milky Way. These space vessels are hardly travelling at Star Trek speeds!!! An illustration by Edward Stone of Caltech given on the right above, shows the four spacecraft entering the Heliopause and all travelling in diferent directions towards interstellar space.